The Step has been receiving very positive reviews. Here is a sampling of some of the fantastic reviews we’ve received. If you’ve read The Step please let me know how you liked it. Email me your comments. 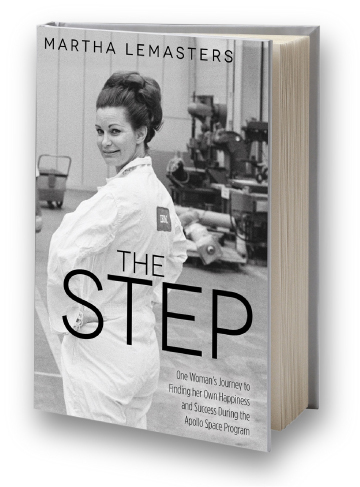 Martha Lemasters’ memoir, “The Step” is a fascinating look at the Apollo space program through the eyes of someone who worked her way up from secretary to PR writer at IBM while showcasing the technological abilities of the contractors who worked with NASA. “Martha Lemasters manages to effectively intertwine personal and professional activities as an IBMer during the Apollo years in her book, The STEP.” The title cleverly ties in with Neil Armstrong’s “That’s one step for man, and one giant leap for mankind,” as he stepped off the Lunar Module onto the Moon’s surface during the Apollo 11 mission. Her step and his are essentially the same as it relates to motivation and implementation for success. Her memoir recollects in amazing detail the technicians, the engineers, the analysts, and the administrative staff that made up the IBM launch support staff at Cape Kennedy. It moves rapidly and sequentially through the Apollo missions as Lemasters confronts issues on and off the job. As a single mother, she pushes her children in the right direction, and as secretary turned writer, she pushes herself to the max to portray IBM and the Apollo program in an accurate light. I won this book through Goodreads. I really enjoyed this book. Loved all the inside information and her journey & hardships. “Martha’s book, The Step, instantly transported me to the magical space race times of the 1960’s and 1970’s on Florida’s space coast. It was impossible not to feel the exhilaration Martha felt as I read about the people and places that played such key roles in space travel over those decades. Page after page, I was there experiencing, right along with Martha, the unforgettable, momentous events which transpired at The Cape. “A Fantastic Inside Look at Our Nation’s Space Program from a Woman Who Blazed a Trail for Us All. What a delightful and important book Martha Lemasters has written! First, we get a good look at what happened behind the scenes at the Cape Kennedy Space Center during our nation’s Apollo program—the talented, dedicated men and women of the IBM launch team responsible in part for one of the greatest feats of technological genius in the history of mankind. “First let me explain, I have been an avid reader for most of my life, but after retiring after 23 years working in libraries I have lost a lot of that enthusiasm. I need to tell you that I just started your book and read the first 5 chapters. I am so hooked. You are a magnificent writer! “I love your book!! I can’t wait to see it succeed and become a movie one day! I love your person, so strong, intelligent, beautiful & athletic!! I love how you handle yourself in the man’s world, and you look after friends not as strong. “Good morning Martha. It is 4:12 a.m. and I just finished your wonderful book. I loved it so much, especially your personal and vulnerable side of you. It was truly a very interesting and magnificent read. It brought back all the memories of our days, months and years at the Cape, both great ones and sad ones as well. All of us, no matter where we live or where our lives took us, will always be family because that is what we were. I still to this day say that my best years at IBM out of the 33 I worked were at the Cape. I feel blessed to still be here and be able to attend our yearly reunions. I also feel lucky to still be in close contact with you and a few others whom I love and admire so much. “Having read The Step, I wanted to congratulate you and say how much I enjoyed it. It is a multi-faceted story, at once historical, autobiographical and ethical. I applaud its very potent feminist message. I wonder if young women will be shocked at how awful things used to be for women, I mean, because the typical male was so awful in his dealings with women. Yet you persevered and would not be put down. Bravo. Maybe those who are grateful for the space program will understand how much your contribution to it meant. My knowledge of NASA and the Apollo shots was very sketchy up to now. I know so much more now. “I must tell you that I am fascinated by your experience with the Apollo Space Program and putting a man on the moon. What an adventure just to be a part of it! Your book is so well written and the way you have written it pulls the reader right in and makes him feel on the scene of history being made. “When I read about your reading and book signing in our local paper, I decided to come and listen. I knew the ending about man landing on the moon but had no idea how much the stories you shared would impact me. On a personal note, I was so touched by the what your Mom endured having an abortion because I learned from my mother that her mother’s death sentence was having another child. She already had too many abortions and giving birth to my uncle knowing a tumor would kill her at an early age was difficult to swallow when Mom explained it. My grandmother died when my Mom was only 16 and they were farmed out to family. As you said last night about your decisions not defining you, Mom made some challenging ones but she gave me great sisters even if we have different fathers. Reading how your children weren’t allowed to play with others because you worked was so foreign to me. I was born in 1962 and I guess by the time my parents separated when I was 8 was more the norm. I had never known my Mom not to work even when they were married. I can relate to the checking account because when my parents split, Dad tried to get Mom for forgery by signing his name on checks as she paid the bills. My, how times have changed. The section you wrote about pro-choice was a different spin that I have never thought about. Birth control is one thing but I never thought about someone in a situation like your mother and my grandmother. I was touched by having you let your mother know about what happened and her freedom to share at that walk. Martha LeMasters went from married to divorced to working mom, a rarity even in the late 1960s. She found a place as secretary at IBM, later moving up to writer, her goal. During the Apollo years, she also found her identity as a woman: strong, independent, and sexually fulfilled. This rang true for me even though LeMasters changed some names to protect the guilty and the indiscreet. Adultery was rampant, divorce even higher. Not surprising when you consider that during the pre-launch time, it wasn’t unusual to work 10-16 hour shifts. Employees for the various companies and agencies lived all the way south to Palm Bay, adding to the amount of time away. It also wasn’t unusual to see astronauts around town during visits to the Cape, picking up groupies who wanted an astronaut notch on their beds. My parents weren’t shy about telling me who they spotted at the various nightclubs in the Cocoa Beach area. I was a child, but never sheltered. My interest in the space program and the people involved in it stems from my childhood. My dad worked in the program from 1956 to 1970, taking a short break to get his degree in Physics in just two years on the advice of Rocco Petrone and Kurt Debus. He worked for the various companies that held contracts with NASA, only leaving because he could see the writing on the wall, the space program was essentially over, layoffs were coming. He loved every minute of it and used to talk to me from the time I was in first grade until adulthood about his job and the people he worked with.